I’ve been having some holiday fun skyping Shirl this week…I’m on holidays, she’s batching at home, so the girls will play! I don’t think that I actually finished anything, but it was so good to just play around and chat and laugh with a friend. Thanks Shirley, we’ll have to do that again…soon! I have been playing with texture, tissue paper and sprays lately and came up with this card. It’s not perfect, not by a long shot, but it was a whole lot of fun to do! Just playing with some Visible Image stamps. It is difficult to stamp on textured backgrounds, unless of course you use layers and cut-out images. But these images were going to be an absolute nightmare to cut out…so I stamped them onto tissue paper, applied gel medium to the reverse side and placed onto the background. The words were not going to fit anywhere…so I stamped them onto tissue paper too! Low and behold…I could use any of the words on the stamp I wanted to this way – so I did! This time I learnt that you have to be very careful with the tissue paper when it is covered with gel medium, if it drops then the image is near impossible to shift…happy accidents can be fun though. On a positive though, if the tissue crumples up a little when you put it down, it doesn’t matter – it just adds more texture! I’m sticking with that line hahaha. And in the grand scheme of things, it doesn’t really matter does it? 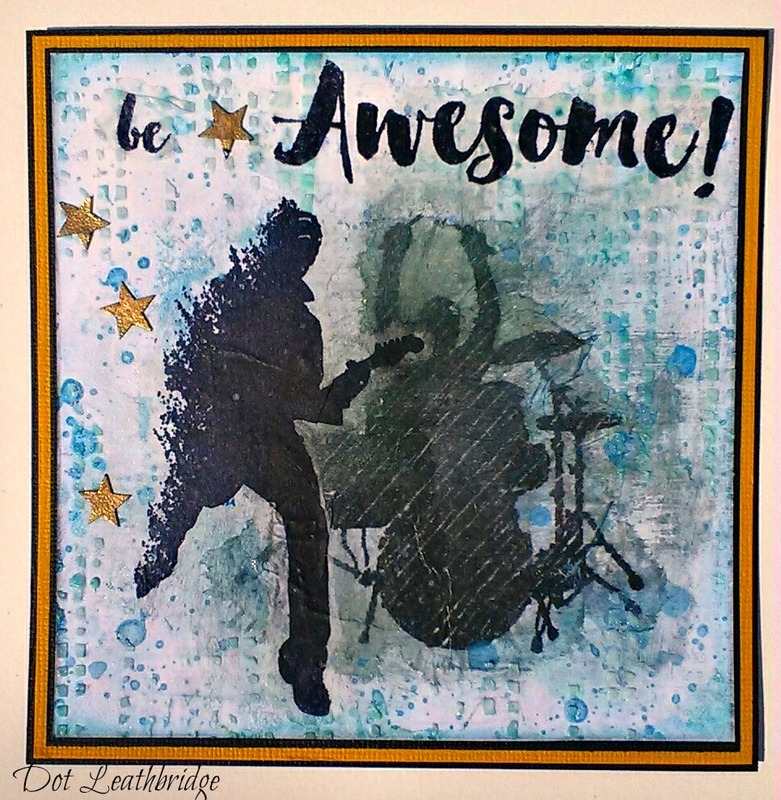 Tip: go around your stamped image with water on a fine brush, gently, and it will just pull apart without the sharp edges that you get with scissors. Brilliant card Dot. The background looks fabulous with those images. Love the pops of the yellow stars. Wow Dot, this is very beautiful. Really awesome! Just catching up after our few days away and popping in to say it's a super creation for this months theme Dot and thanks for your warm welcome. Your just getting boring now because everything you make is stunning and making me jealous.